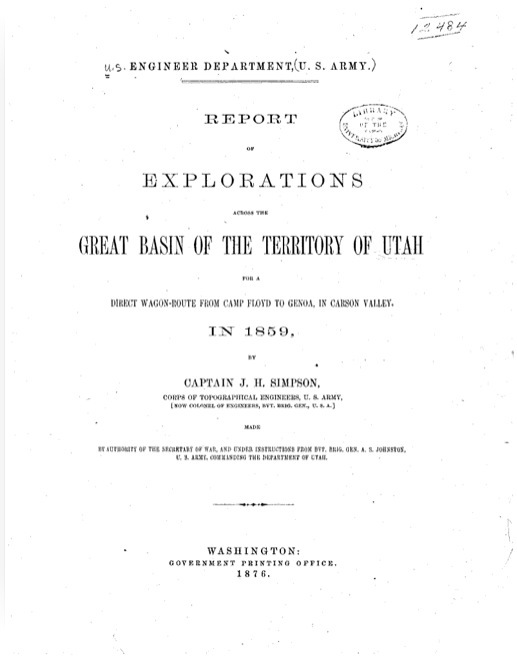 A new main wagon route across Utah and central Nevada was explored in 1859 by Capt. J. H. Simpson of the Topographical Engineers. 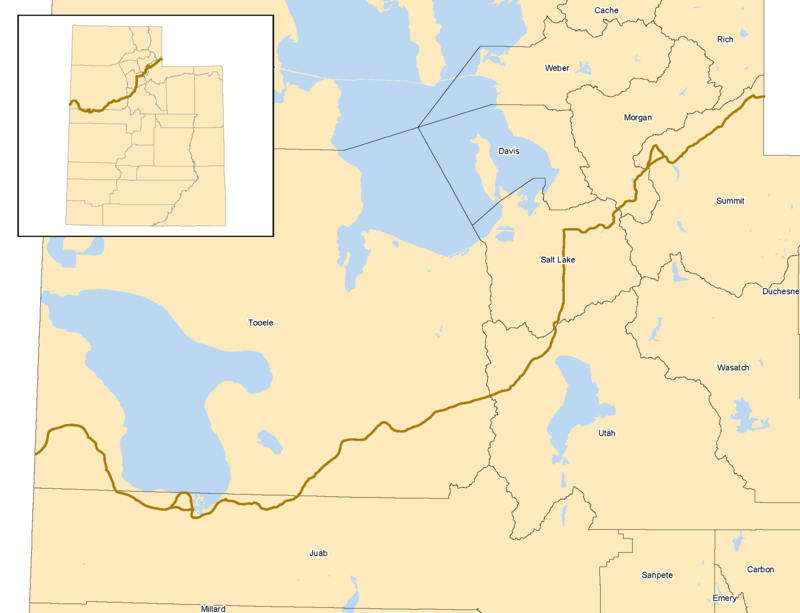 This became known as the Central Overland Route or Simpson’s Route and was quickly adopted by the Pony Express and the Butterfield Overland Stage. It saved over two hundred miles over the northerly route down the Humboldt River. 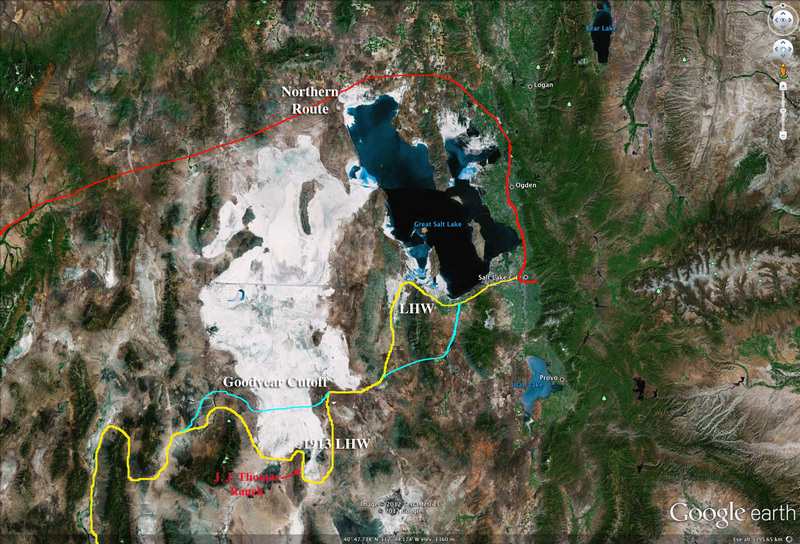 It ran from Camp Floyd south of the current city of Tooele, Utah to Genoa near Carson City, Nevada. I highly recommend to you the e-book of Simpson’s report found here: http://www.archive.org/details/reportofexplorat00simp . The book is available in different reading formats including Kindle but can be read on your computer too. The reason I bring this up is that some of the route the Lincoln Highway used to get around the Great Salt Lake was from Simpson’s survey. Of the two motor routes considered at the time, one would go north of the Great Salt Lake and join the original Emigrant Road, while the other would go far around the southern portion of the old lake as far as J. J. Thomas’s ranch, now known as Fish Springs N.W.R. to connect with Ely. As always. click to enlarge the maps and other images. We’ll be following the 1913 route from near Tooele UT to Ely NV. Along the way we will also find Pony Express and Overland Stage Stations. This entry was posted in Desert, Lincoln Highway and tagged Fish Springs, J. H. Simpson, J. J. Thomas, Overland Stage, Pony Express, Tooele. Bookmark the permalink. What a great coincidence! My husband and I plan to take this trip in July from SLC to Ely. I can’t wait to hear what you discover and any tips you may have. I understand this route is quite remote and the condition of the road a bit sketchy so I hope you will be able to shed some light on it.